Despite being a graphic artist who takes pride in creating pleasing designs, I also have a great love for really, really bad design, which never stops amusing me. I saw this abomination on The Chive, in a post about bad toy knockoffs. 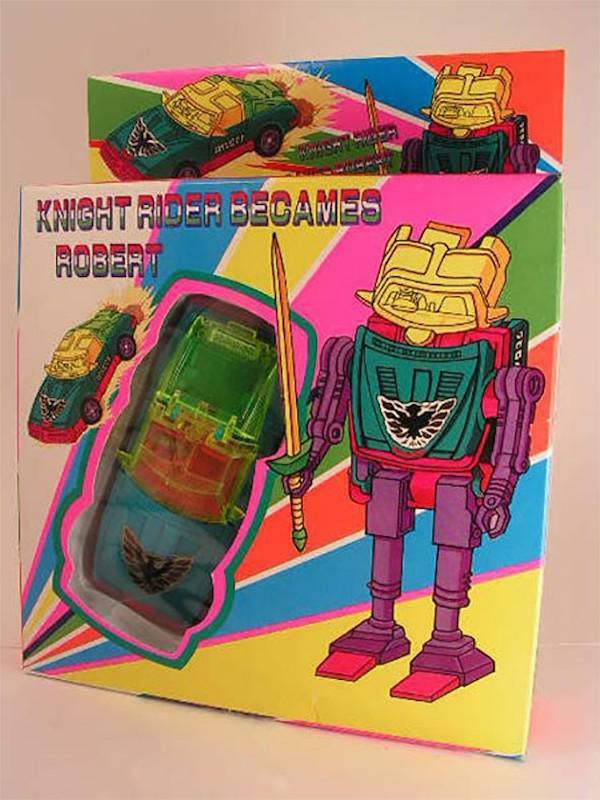 It looks like it's supposed to be a Transformer-style toy, but the colors and packaging are hilariously crappy. The name says, in Mexican/Italian colors, "Knight Rider Becames Robert" instead of what I believe should be, "Knight Rider Becomes Robot". This, along with the crazy overall neon color scheme and primitive graphics, makes for a memorably bad example of graphic design. After a little research and reading comments on other blog posts, it seems to be a ripoff of Super Gobots Zeemon.